Don't Walk and Don't March for Roe V. Wade!!!!! 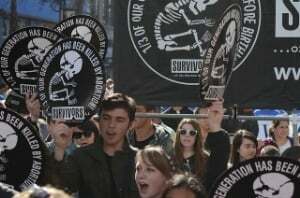 This year The Survivors are asking young people not to March in Washington DC. We are asking young people not to Walk in San Francisco. And we are asking young people to forgo the rallies and forgo the walk at One Life LA!!! Why? Because that is not our job. Have you ever been to a County fair? You don't see soldiers walking around celebrating America's greatness or the hometown charm. The Army is there, the Navy, Coast Guard, Marines, National Guard and the Air Force are all there! Doing what? Recruiting! They would all love to be riding the rides and eating corn dogs but that is not their job. Their job is to bring young people into full-time service to their country. And likewise the Survivors are going to the March in DC and the Walk for Life in San Francisco and the One Life LA walk and rally too! But we are going to recruit young people to full-time prolife work. There are lots of young people who will be marching and walking and we want to recruit a full time warriors to join The Resistance and confront Planned Parenthood throughout this coming year. Will you do duty as a recruiter with us? Will you join Survivors in Washington DC, San Francisco, or Los Angeles? We have printed thousands of Survivors Logo Rounds including the new Latino Day of the Dead Round. We will be handing out thousands of these rounds with a recruiting postcard affixed on the back. Will you join us in giving out these rounds to potential recruits as they arrive to these events? Will you march like a fish swimming upstream with our special recruitment posters urging young people to do more than march once a year? Below are the cities and contact person for each location. It helps us plan if you can let us know you will be coming please let us know where you can join us. But if you just show up we appreciate the help and it will be a great day of activism. So don't walk, don't march - run towards the cries of injustice and join the Survivors Resistance in the largest recruiting effort of the year! Thank you for helping to recruit full-time warriors in the fight against Planned Parenthood. See you there! Sponsored by Survivors of the Abortion Holocaust. #ProtestPP and Candlelight Vigil to commemorate January 22, 2015 -- the actual day that the Supreme Court handed down the Roe v. Wade decision 42 years ago. Click here for more information. Speakers include Rev. Clenard Childress, Pastor Bruce Rivers, Pastor Walter Moss and Walter Hoye. Download the event flyer here. Guests include Dr. Alveda King, Rev. Clenard Childress, Cecilia Chavez, and Lori & Walter Hoye. For more information, visit here. The event flyer may be downloaded here. Contact Joni at 925-550-3122. Mass with Archbishop Cordileone and his fellow bishops. In connection with the annual March for Life in Washington, D.C., #ProtestPP is hosting a prayer vigil and rally at the construction site of a new Planned Parenthood mega-center in the nation’s capital. Hear from key leaders in the pro-life movement. Be encouraged by fellowship with hundreds of pro-life youth. Archdiocese of Washington will host the Youth Rally and Mass for Life on the morning of the National March.